This homemade DIY body butter is perfect for giving your driest parts a little extra love during the coldest months of the year. Comfort and self-care is extremely important for mental wellbeing in the winter. This easy calming DIY lavender body butter can be an essential part of any wellness routine, especially if you are someone who suffers from dry, sensitive skin. 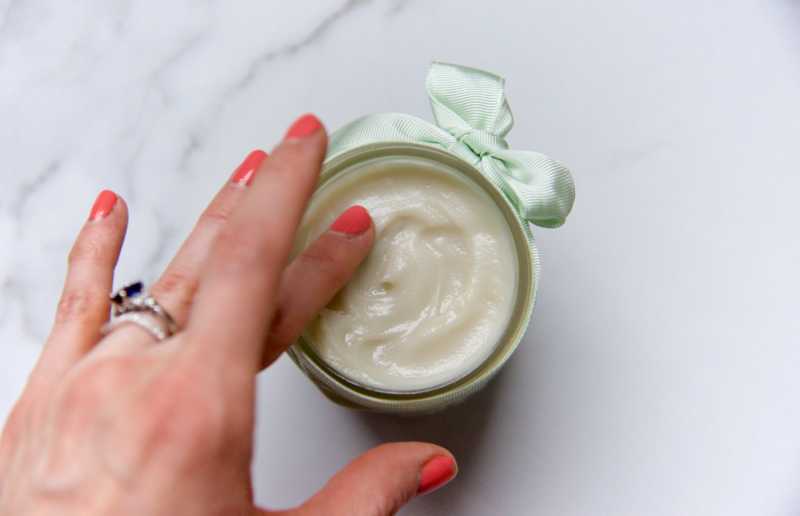 Plus, this body butter is so easy and fun to make! (Especially when you’re cooped up indoors during inclement weather.) It’s also vegan and cruelty-free. Our DIY body butter combines shea butter, coconut oil, lavender oil, and healing Vitamin E to make a rich, moisturizing winter salve. It also makes a lovely, low-cost gift– perfect for holidays and housewarming parties. Studies show that lavender aromatherapy is effective at quelling mild stress and anxiety. We include lavender essential oil in this body butter recipe to give it added relaxation properties, but you can easily swap the lavender for rose oil, sweet orange oil, lemongrass oil, or another essential oil in your preferred scent. Melt shea butter and coconut oil over a double boiler. If you don’t have a double boiler, make one by placing a glass bowl over a sauce pan filled with 1-3 inches of water. Bring water to a boil first, and then reduce to a simmer and place glass bowl on top. There should not be any gaps between the bowl and the saucepan; the glass bowl should rest comfortably on top. Remove the bowl of melted coconut oil and shea butter from the heat and let cool for 30 minutes. Stir in 30-40 drops of lavender essential oil and 7 drops of Vitamin E oil. Then, place bowl in the freezer for 35 minutes to thicken up. Mix the body butter together and scoop into a clean glass jar once it looks like whipped butter. Viola! For best results, apply to the body post-shower, when skin is slightly damp. For best results, store this lavender body butter at room temperature for up to 2 years. Keep away from direct heat or sunlight. Enjoy! 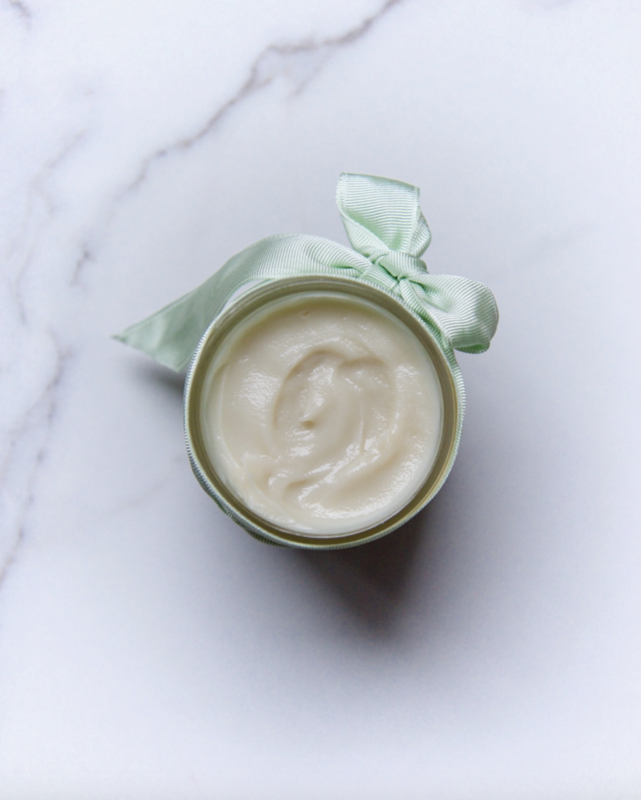 Fun Fact: Vitamin E is a powerhouse ingredient in this DIY body butter formulation. Not only does it help mitigate wrinkles and fade scars, but it also acts as a natural preservative. It keeps the shea butter and coconut oil stable for longer, without adding chemicals. Experiencing chronic stress or anxiety? Consult our Comprehensive Anxiety Toolkit— a one-stop archive of the most effective science-backed methods for calming an anxious mind.